Jan 24 WHICH CARD IS CALLING TO YOU? How are you doing today? How is your mental space? Are you keeping your mind tidy or have you have been struggling with somethings lately? Or maybe you’ve been in your groove, flowing with the rhythms of life. Either way, welcome to our three cards draw! Gaze upon the image above and notice which card stands out to you. Once you have chosen your card continue scrolling to check out the reveal! If you enjoyed participating in this reading with us - please feel free to share it with your friends. Perhaps this is the message your loved one needs to hear today as well. Thank you for reading and participating! 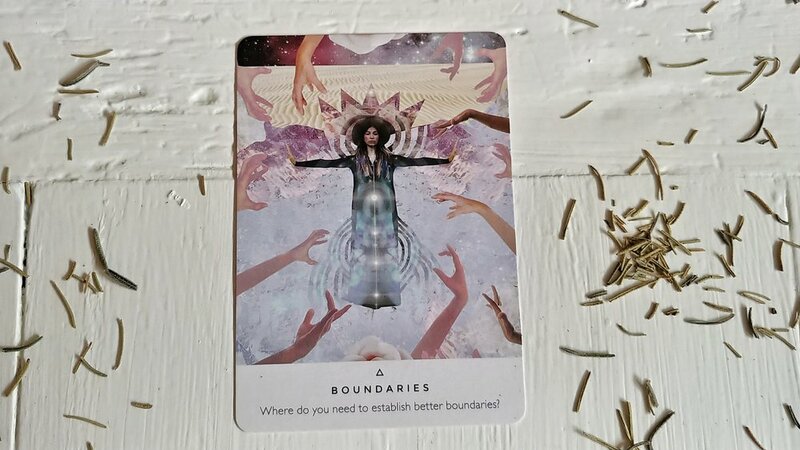 Where do you need to establish better boundaries? When someone asks you for something - a favor, your time, a service - do you pause before you say yes or no to check in with what your body is telling you? Have you taken time to observe the ways you “give yourself away”, as Laurie from astrolore recently asked me? Recently I’ve been examining the places I move to fill a void, simply because the need is there, and not necessarily because it something that is aligned with my values and what I desire to create in my life. I’ve been filling in the spaces of the darkness others carry with My Light for years now without much consideration for what I maybe sacrificing of myself. It is good to give. We need to allow our soul to radiate towards others. It is best done with conscious consideration, or at bare minimum, a breath and body check in. You want all of these things for yourself and those you love - where will they go? Where will you plant them if you are holding on everyone else’s shadows. Give them back. Stand on your ground, within your body and shine your brilliant radiant soul from there. As I will be doing. You can heal, you can be a steward of service and compassion without giving yourself away. You can satisfy your own wants and needs without giving yourself away. You do not need to know how, you simply need to be open and willing for the path to unfold as each moment moves on. What are you clinging on to? Sometimes we get so stuck in a way of being, or a belief about who we are that our identity becomes tangled in the threads of lives we once lived. Both in this time and space, and others. What are you clinging to right now? What ideas or perspectives are you insisting upon that don’t quite fit with where you are at this moment? The walls are beginning to crumble. New pieces of you are starting to shine through in surprising ways that may bring up feelings of discomfort. All the experiences are part of the human journey. The more you resist, the more they will persist. Relax into what is showing up for you now and steer away from the urge to push ahead. You cannot predict a timeline for your healing, it is not linear. Follow the steps that are showing up in front of you without needing to know the whole plan right now. With every step you take and intention you hold, a new path unfolds before you. As you move forward, the universe will meet you where you are. Keep in mind that those around you are a reflection of what you already have within you. Call upon your personal strength and courage to build upon your self-reliance at this time. What is not aligned or needs to change? You may be feeling pulled towards something right now. Allow your heart to wander in these places. Follow the trails of magic and mystery and you just might discover something new about yourself. Do not relate this moment in time to any other occasion or happening. You have never been here before. Not in this way, not at this time, not as who you are right now. With that acknowledgement, you can allow the winds of change to wash over you and sweep away the cloak of the past so you no longer have to feel its weight. You have permission to release. You have permission to start new and fresh, that opportunity is already here for you. Through this current lens, you will be able to more appropriately see what no longer fits into your life. Be it habits, relationships, desires, dreams, thoughts - if their expiration date is here - set it free. And every time it shows up again, set it free once more. This is where space is created for universal order to show up that is more in alignment with what you are wanting. Without the cloak of the past upon you can create from the new, instead of the old version of who you once were.